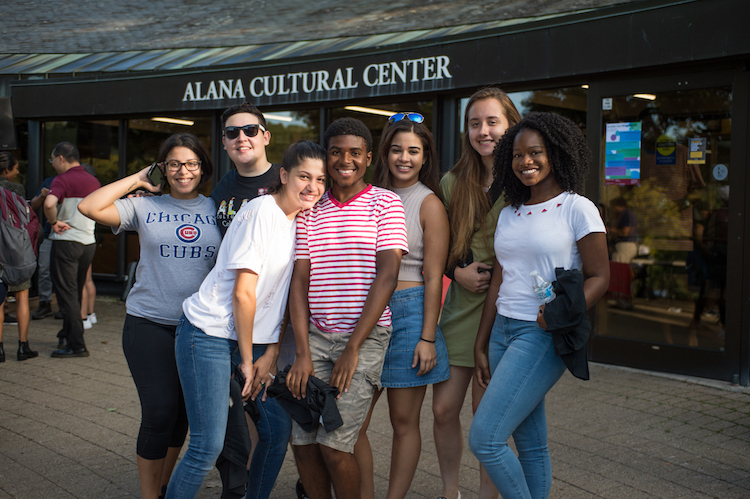 On September 13, the Africana, Latin American, Asian American, and Native American (ALANA) Cultural Center hosted its annual ALANApalooza event. The celebration, welcoming students, faculty, and community members back to campus, featured local catering from Mr. Ed BBQ based in Sherburne, N.Y., student clubs and organizations encouraging new students to join, and music from one of Colgate’s student DJ, Jason Dominguez ’19. This year, the ALANA Cultural Center partnered with the Colgate Vietnamese Society and the Office of International Student Services to broaden the scope of attendees. Director of the ALANA Cultural Center LeAnna Rice says that the long-standing tradition of ALANApalooza highlights the center’s mission to promote community bonding and multiculturalism on campus. “ALANA’s mission and vision is to provide programming, educational opportunities, workshops, and trainings that support the community while teaching more about different ethnic backgrounds and different cultures,” said Rice. Looking forward, staff at the ALANA Cultural Center are excited to host events that promote what Rice calls “radical self-care.” Upcoming events include screenings of The Latino List, which looks at notable figures within the United States and Latin America, an alumni and student of color mixer during Bicentennial Kickoff weekend, and a student panel discussing activism in partnership with the Picker Art Gallery’s latest exhibition, Let Us March On: Lee Friedlander and the Prayer Pilgrimage for Freedom. For first-year student Janisa Middleton ’22, the upbeat and informal atmosphere of ALANApalooza provided a refreshing break from academics. For Dayna Campbell ’17, ALANA Outreach and Program Coordinator, ALANApalooza offers the opportunity for students to meet Colgate’s newest ALANA director and learn more about resources and programs.